Who knew traveling abroad can be that easy! Here is a good news for the people of Pakistan. 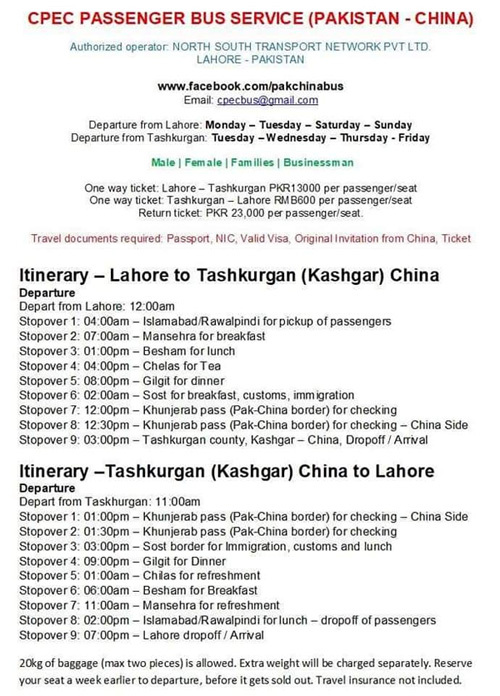 Now you can Travel to China on a bus from Pakistan! Well, yes you have read that absolutely right! The service named CPEC Passenger Bus Service (Pakistan-China) will start operations from November 3rd. CEO, Muhammad Anwar confirmed that it will be a 30-hour long trip, and the passengers will get to enjoy the view of beautiful sights of northern Pakistan. * Includes breakfast, lunch, dinner refreshment beverages, tea, and snacks. * Super fast free WIFI The bus will travel from Lahore’s Liberty to Kashgar, China. Stay tuned to Apniisp for more upcoming updates.